Clomiphene Citrate (Clomid) was one of the original drugs used in post-cycle-therapy to stave off gynocomastia and raise the body?�?�?�????????? ?s natural testosterone levels. There are some side effects involved with heavy prolonged use, such as vision problems, and there are more effective substances on the market that do the same thing, but Clomid is still an effective and inexpensive compound for any athlete?�?�?�????????? ?s post-cycle-therapy. Clomid is chemically a synthetic estrogen with both agonist/antagonist properties, and is very similar in structure and action to Nolvadex. For athletic purposes, Clomid does not offer a tremendous benefit to women. In men however, the elevation in both follicle stimulating hormone and (primarily) luteinizing hormone will cause natural testosterone production to increase. This effect is especially beneficial to the athlete at the conclusion of a steroid cycle when endogenous testosterone levels are depressed. If endogenous testosterone levels are not brought beck to normal, a dramatic loss in size and strength is likely to occur once the anabolics have been removed. This is due to the fact that without testosterone (or other androgens), the catabolic hormone cortisol becomes the dominant force affecting muscle protein synthesis (quickly bringing about a catabolic metabolism). Often referred to as the post-steroid crash, it can quickly eat up much of your newly acquired muscle. Clomid can play a crucial role in preventing this crash in athletic performance. As for women, the only real use for Clomid is the possible management of endogenous estrogen levels near contest time. This can increase fat loss and muscularity, particularly in female trouble areas such as this hips and thighs. Clomid however often produces troubling side effects in women, and is likewise not in very high demand among this group of athletes. 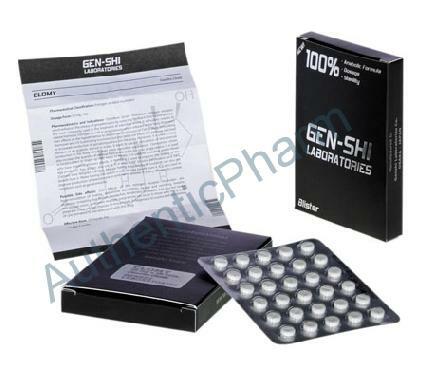 Male users generally find that a daily intake of 50-100 mg (1-2 tablets) over a 4 to 6 week period will bring testosterone production back to an acceptable level. A very common regime of dosing is; 300 md/day 1, 100 mg/day for days 2-11, and 50 mg/day for days 12-21. This raise in testosterone should occur slowly but evenly throughout the period of intake. Since an immediate boost in testosterone is often desirable, many prefer to combine Clomid with HCG (Human Chorionic Gonadotropin) for the first week or two after the steroids have been removed. The kick-start from HCG also helps to restore the normal ability for the testes to respond to endogenous LH, which may be hindered for some time after the cycle is ended due to a prolonged state of inactivity. Once the HCG is stopped, the user continues treatment with Clomid alone. HCG should not be used for longer than two or three weeks though, as the resulting increased testosterone and estrogen levels may again initiate negative feedback inhibition at the hypothalamus. When planning your ancillary drug program, it is also important to remember that injectable steroids can stay active for a long duration. Using ancillary drugs the first week after a long acting injectable like Sustanon has been stopped may prove to be wholly ineffective. Instead, the athlete should wait for two to three weeks, to a point where androgen levels will be diminishing. Here the body will be primed and ready to restore testosterone production. Clomid and HCG are also occasionally used periodically during a steroid cycle, in an effort to prevent natural testosterone levels from diminishing. In many instances this practice can prove difficult however, especially when using strong androgens for longer periods of time. There is also no exact method for using the two drugs in this manner.